Algal bloom season is here. These tools will help you keep track. 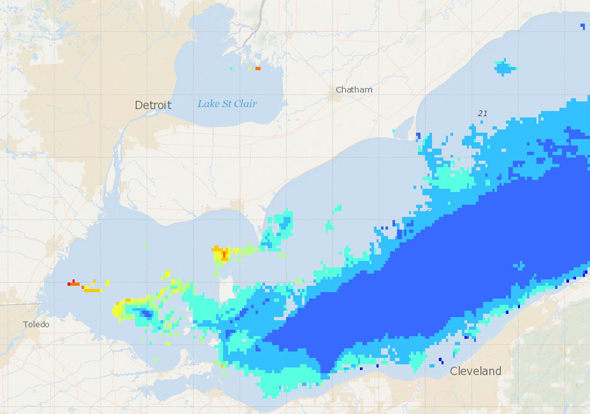 A bloom of harmful cyanobacteria has grown in Lake Erie’s western basin, according to the latest bulletin released today by the National Oceanic and Atmospheric Administration. 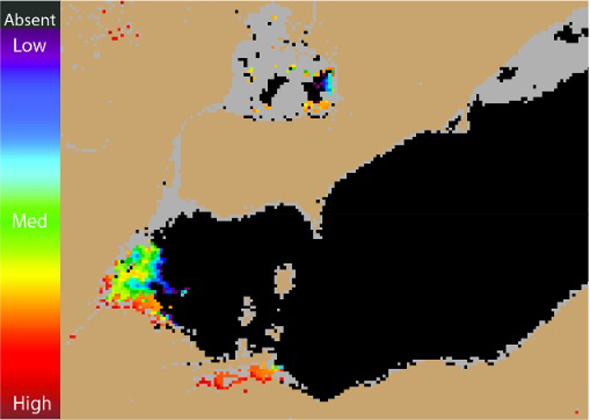 The bloom is concentrated in Maumee Bay, while a separate and smaller bloom has appeared in Sandusky Bay. 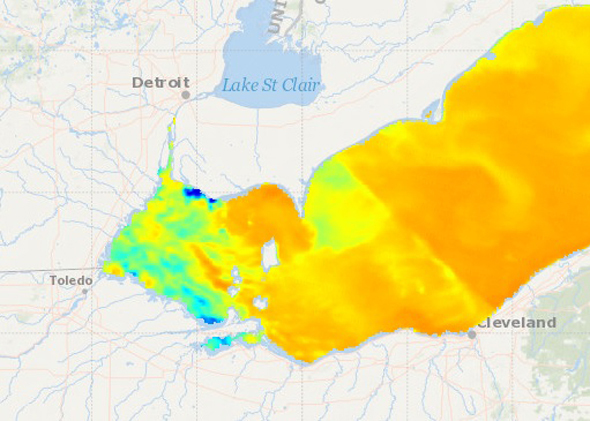 As part of our ongoing coverage of toxic algal blooms in the Great Lakes, which shut down a public water supply system for the first time last fall, we are creating a space to bring together a range of available maps and data to track the progression of these blooms. Do you know of a great data source, or would like to see something included in our Algae Dashboard? Share your ideas on Twitter! @circleofblue You can also share your photos of the algal blooms on Circle of Blue’s Instagram account by using #GLalgae #circleofblue. The satellite images below show the current bloom intensity and forecasts of how it may evolve in the next few days. Modis Aqua Cyanobacterial Index, July 31. Grey indicates clouds or missing data, while cooler colors indicate low concentrations and warmer colors indicate high concentrations. Click image to enlarge. Forecast position of bloom for August 4 using GLCFS modeled currents to move the bloom from the July 31 image. Click image to enlarge. You can see NOAA’s complete bulletin here. 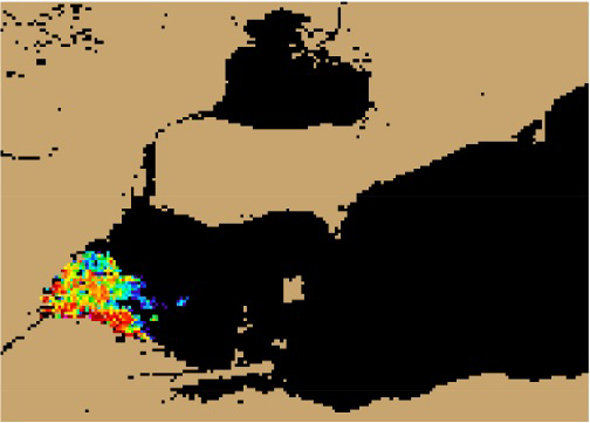 Information about water temperature, which can influence algal blooms, is available from both the NOAA bulletin and the Great Lakes Observing System — a network that pulls near real-time data from various sources in the Great Lakes Basin. Surface water temperatures as of July 24. GLOS also publishes remote sensing images of chlorophyll concentrations. Chlorophyll is found in algae, but not all forms of algae are harmful. Chlorophyll concentrations as of July 21. Click image to enlarge. Access the GLOS data portal here. Never seen this problem at this level of severity even in the 60s and 70s before phosphates were banned in detergent. The lake was getting cleaner. What’s different now? Factory farming. Let’s be honest. This is the price of meat eating. Stop coddling big ag. Shirley, I don’t disagree – but you should know that the Zebra mussels which consume green algae and were a part of cleaning up the lake, do not eat the toxic blue-green algae, which thrive in the cleaner lake (albeit more full of fertilizers). This has been an issue for years. Much is caused by golf courses, their man-made ponds full of herbicides/ pesticide chemicals that run-off into lakes. They are EXEMPT by the gov’t and permitted to use poisonous chemicals such as from Monsanto. It’s Summer, cottages/homes with septic tanks too close to the lakes esp. the ones with huge lawns… with rainfall, the septic tanks are leaching out. We have fewer farms now these days, so it’s not them. The majority of problems are from all the Golf courses and homes by the water who have NO regulations. It’s happening all over Canada too. Golf courses should be held accountable, as they got away with this for way too long with polluting the aquatic ecosystem. They earn billions in revenue and won’t change their ways for the environment. They can afford it. Farm Fertilizer use has not been increased for more than 40 years in this watershed. If anything it has been decreased due to new technologies such as variable rate applications which apply nutrients only where it is needed. I am a farmer and I can tell you no one would over apply these costly nutrients if it is not needed to grow these crops. So the excess Phosphates are coming from other sources. Most likely sewage from Detroit and Toledo, or lawn fertilizer that is a huge business and is not regulated at all.